I feel like we are in a lunch rut lately. I have no idea why, they're eating and all that, but I haven't been quite feeling the "Make a really cute lunch" vibe. 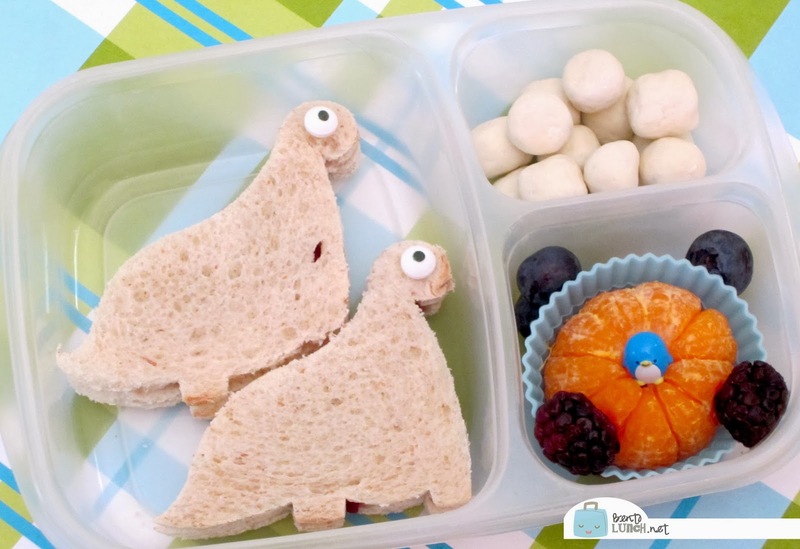 Ben, however, was feel in the "Eat a cute lunch vibe" so I had to whip up some little dinosaurs for him. He took cream cheese and jelly dino sandwiches on honey wheat bread. I have a really simple dino cutter I got at Walmart years ago that uses the whole bread and just leaves a teeny bit of the crust. Dante-puppy hangs around during the lunch making time for these crusts. The eyes are Wilton sugar eyes, with a dot of cream cheese on the back to keep them in place. To the right, he has granola bites coated in Greek yogurt, a clementine and the last few blackberries we had in the fridge. He also took yogurt, a granola bar and a cheese stick for his snacks. Lunch is packed, as it mostly is, in our Easy Lunchboxes.